Output Hardcopy Devices provides a technical summary of computer output hardcopy devices such as plotters, computer output printers, and CRT generated hardcopy. Important related technical areas such as papers, ribbons and inks, color techniques, controllers, and character fonts are also covered. Emphasis is on techniques primarily associated with printing, as well as the plotting capabilities of printing devices that can be effectively used for computer graphics in addition to their various printing functions. Comprised of 19 chapters, this volume begins with an introduction to vector and raster plotters, presented from the viewpoint of the user. The general considerations that apply to these types of hard copy devices are discussed, along with the problems and pitfalls that the user may encounter. The vector plotters cited are the drum and flatbed types that use pens to write on some type of medium, such as paper. 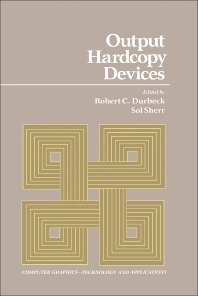 Subsequent chapters focus on plotters and hard copy imaging technologies, and those that use CRTs as the image source, with cameras as the primary means for producing the hard copy. Impact and non-impact printing technologies as well as other technology areas that are very important to plotters and printers are also examined. This book should be of value to students and researchers interested in printing and computer graphics.